I'm thrilled today, to be able to feature my friend Sky Purrington's latest release in this fantastic series! idea of a ring binding him to one lass seems far-fetched. 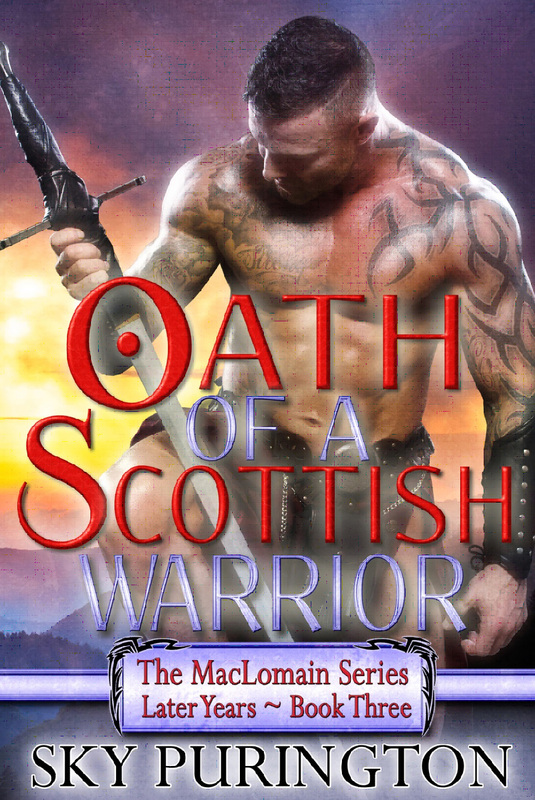 However, when a woman named Jackie calls to him from the dark edges of the Celtic Otherworld, he swears an oath to save her. That means traveling to the future to protect her before she’s taken by the enemy. The only problem? She is not where she should be. Instead, he finds a beautiful, defiant lass named Erin. Now he must make a choice. Continue seeking out Jackie or protect the one he’s with. Doing her best to keep her eyes averted, she held out a mug. “Here, drink. It’ll help warm you." She hated to admit it but he was right. “I’ll get there. Promise. It just doesn’t look like it’ll be happening right now.” Though it was about the last thing she wanted to say for more reasons than one, she said, “Why aren’t you still with the redhead? After you warm up, it might be best if you rejoin her. “Nay.” He refilled his mug and handed her one as well. “While she was pleasant enough, I couldnae seem to muster desire for her." “Well, you’ve got nothing to be jealous of because Darach and I are just friends and me and my Viking posse have an understanding.” She took several sips as she navigated around him to the fire without meeting his eyes. “All that aside, we both need to remember that not only is what we’re feeling nothing more than a dragon thing but that Jackie’s out there somewhere waiting for you." “Why did you not take Tait tonight?” Rònan’s question was a deep rumble close to her ear as he moved behind her. “I know he offered and I know you were tempted to accept." “I can’t.” She shook her head but couldn’t manage to step away, could not get her feet to work. Sky Purington is the best-selling author of over twenty novels and several novellas. A New Englander born and bred, Sky was raised hearing stories of folklore, myth and legend. When combined with a love for nature, romance and time-travel, elements from the stories of her youth found release in her books. She loves to hear from readers and can be contacted at Sky@SkyPurington.com. Interested in keeping up with Sky's latest news and releases? Visit Sky's website, http://www.skypurington.com to download her free App on iTunes and Android or sign up for her quarterly newsletter. Love social networking? Find Sky on Facebook and Twitter. $25 gift card to winner’s choice of Amazon or Barnes & Noble.